It is perhaps a bit cliché to say they don’t make cars like this anymore, but it’s true. Properly coachbuilt Italian runabouts are a thing of the past, but this Fiat Vignale 1100 Desiree is perhaps the perfect example of what was once a popular trend. 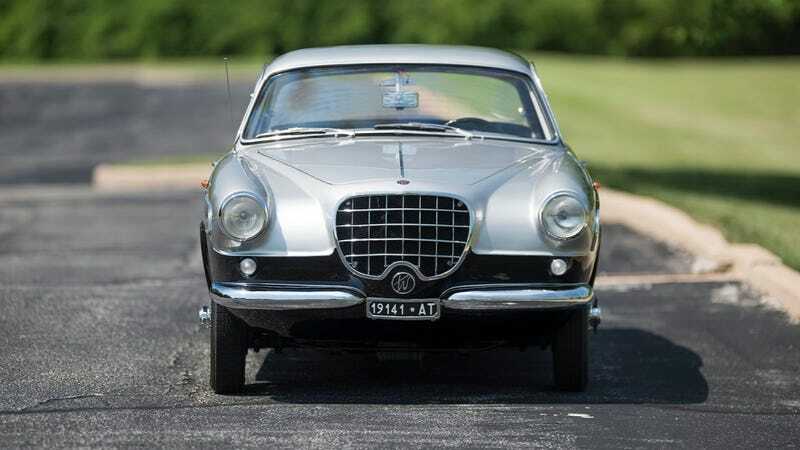 Take a boring standard Fiat 1100 and add a gorgeous, if a bit busy, Giovanni Michelotti-penned body by Carrozzeria Alfredo Vignale in Turin, Italy, and you’ve got a handsome little sporty car. This particular example hides an even more exciting history. This 1957 example is one of just three cars built by Fiat to compete at the Mille Miglia that year with the chassis and engine modified by the factory motorsport division for the intent of competition. While factory-prepped Fiat 1100s won in both 1.1-liter class entries that year, it is unclear which of the cars this chassis is, or whether it was even entered in the race at all. Three were built, two appear to have been entered, but no note is made as to whether this chassis is one of them. It seems Fiat wasn’t incredible at keeping track of chassis numbers in 1957. The Fiat 1100 Series chassis dates back to 1937, already a 20 year old design by the time this car was built. Amazingly, as an aside, this body continued to be built by India’s Premier Automobiles company until 2000. The Touring Veloce engine was the most powerful version of the car, having made a fiery 48 horsepower. With a Weber carburetor and a 4-speed column-shifted manual transmission, this sportif-oriented model held some serious performance potential. This particular Vignale Desiree, in gorgeous two-tone paintwork, has recently been invited to participate in the Mille Miglia Historics, as well as receive display on the lawn at the Pebble Beach Concours. Considering it will be otherwise engaged in sale at the Mecum Auction in Monterey at the time, it likely will have to decline that Pebble Beach invitation. It’s easy to see why it would have been invited, however, considering the stunning hand-assembled body and lovely presentation. Michelotti clearly took inspiration from other Vignale designs in his work with the Desiree, though influence from larger and much more expensive models like Facel Vega or Dual-Ghia. Both were style icons of the period, driven by celebrities and the more hip heads of state. For Fiat to offer a small and relatively inexpensive family runabout with the styling of those big lira models would have been a popular move in the day. With spinner knock-off Borrani wire wheels, a push-button radio, two-tone paint, matching interior, and what appears to be a spectacular presentation, this Fiat is the precise kind I’d like to have. If you want to add it to your collection, get yourself to Monterey, California in late August and prepare to bid wisely.